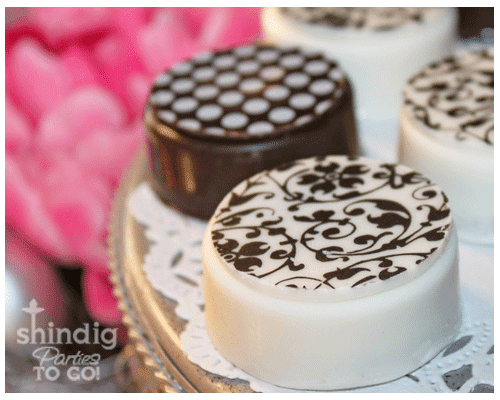 When I first saw these gorgeous chocolate covered Oreos I figured they were store bought. But they aren't. Then I figured the tutorial would be super complicated or above my chocolate dipping skill level. But it isn't. Even the gorgeous designs on the top, totally doable. 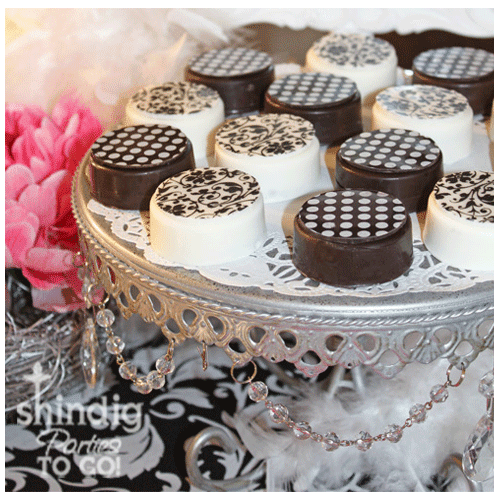 You can check out the tutorial for covering the Oreos and creating those beautiful chocolate disks over at Shindig Parties To Go. And even if you aren't a fan of chocolate dipped Oreos, head over and learn how to use chocolate transfer sheets because you can make some pretty amazing things with them. When you said I could do this myself, I thought for sure I would be glue-sticking cardstock onto cookies. But you can actually EEEEEAT them! What a fabulous surprise to see "me" here! How much fun for you to share my Oreo tutorial! Thanks!! Oh my gosh! These look amazing and so delicious!! I am so putting this on my to do list!